I've begun some baby steps on my journey to learn the new Apple TV development tools and platform and we just discovered that the cumbersome tvOS Simulator Remote can almost be ignored because we can use our development keyboards in it's place. 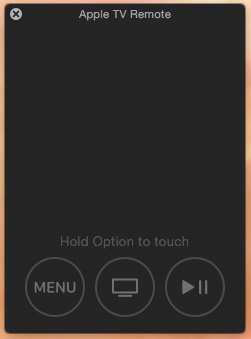 Playing around with the new Apple tvOS development kit you may have noticed that using the simulator remote is quite annoying. Not only does it force you to take you hand off the keyboard (to move to the mouse), but's just plain awkward to have to hold down Option while you use the Mouse and Swipe Up/Down/Left/Right when you may be trying to do is navigate the U.I. Luckily a coworker stumbled upon the arrow key commands and we quickly figured out a mapping of tvOS Remote Buttons <--> Keyboard Keys that can help any developer navigate and test their tvOS app just a little faster within the simulator. Touch Surface (click/select) <Enter> Also <Enter> on the number pad does NOT appear to work. If you discover what the two Unknown values above map to, leave a comment below and I'll update this post with the complete list.